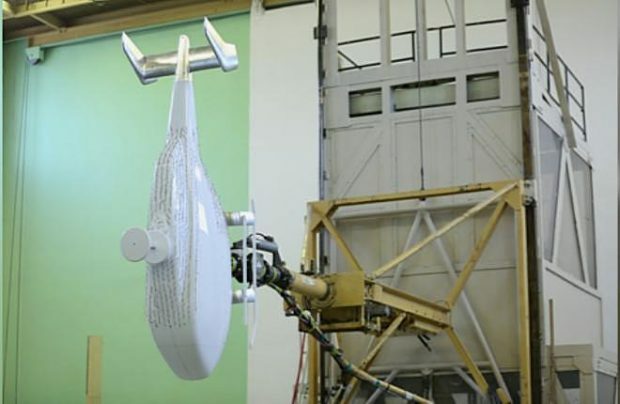 Russia’s Central Aerohydrodynamic Institute (TsAGI) has successfully completed the first stage of aerodynamic tests of a 1:4 scale model of the VRT500 advanced light utility helicopter, designed by VR-Technologies (part of Russian Helicopters holding). The tests defined the levels of drag generated by the airframe and its main elements: its fuselage, engine nacelle, and both the main and tail rotors. The aerodynamic performance of the airframe was tested in TsAGI’s vertical spin wind tunnel across a wide range of angles of attack and sideslips, including its longitudinal and lateral static stability characteristics. TsAGI also examined the airframe mock-up’s flow patterns and determined its downwash angles in the stabiliser area. The test results positively confirmed the design projections for the rotorcraft, TsAGI has concluded. The VRT500 project, which is Russian Helicopters’ first model in the less-than-two-tonnes category, was unveiled at the HeliRussia 2018 show in late May of this year. The helicopter, with a take-off weight of 1.6 tonnes, features a coaxial main rotor, and can carry up to five passengers, or 730 kilos of payload. The manufacturer plans to offer passenger, freight, training, medevac and VIP versions of the rotorcraft, and is hoping to win up to 15 per cent of the global light helicopter market (in the respective size segment) by 2035. The VRT500 has two possible engine options – Safran Helicopter Engines and Pratt & Whitney Canada. Russian Helicopters earlier revealed that the VR500’s maiden flight is scheduled for 2019, and the launch of serial production is targeted for 2021, at the Ulan Ude Aviation Plant.